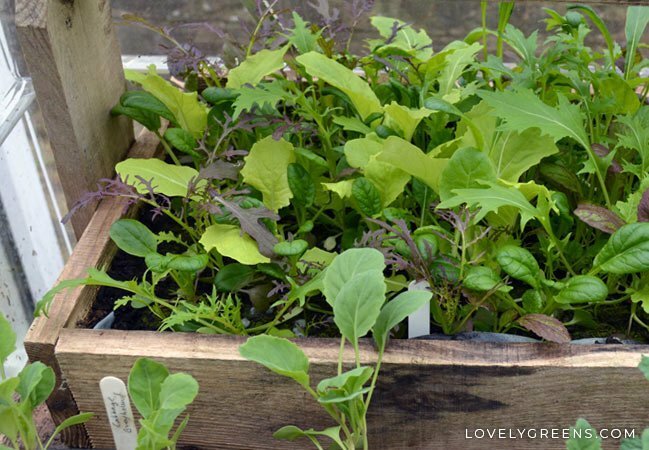 No matter how large or small of a growing space you might have, baby salad leaves grown in the home or just outside are ideal for fresh green salads. I have two plots at my allotment now and plenty of room to grow greens but I find it so much easier to gather them from outside the kitchen door. Having a few containers of lettuce nearby makes it so much more convenient to maintain a healthy diet plus the time from ‘garden’ to plate ensures that you’re getting the freshest and most nutritious vegetables possible. 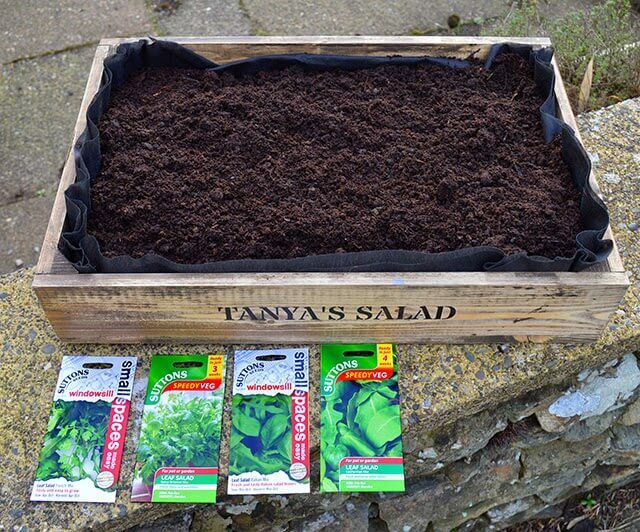 I love having a few containers of greens on hand and it was with delight that I received a surprise delivery from Suttons Seeds last month with a new product they’re now retailing – a personalised salad garden box and four packets of seeds. I occasionally review products for Suttons and I was delighted to receive this gift. 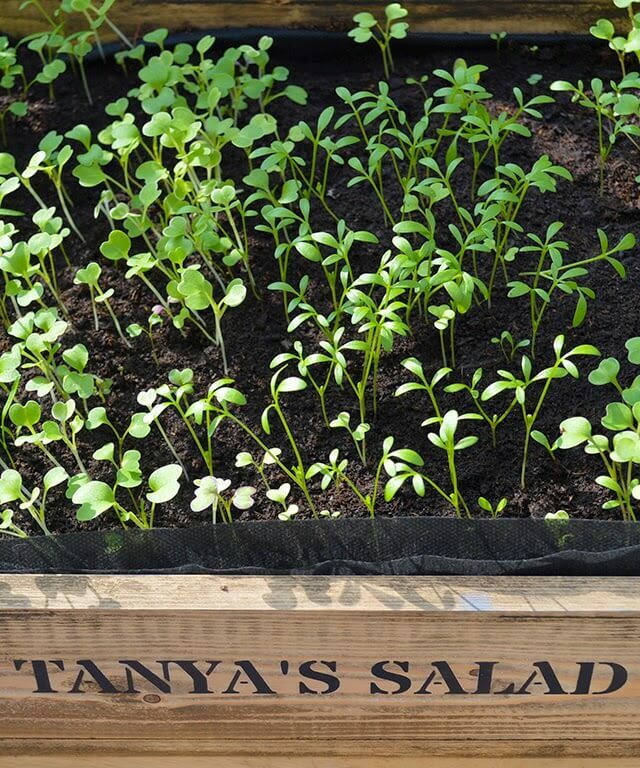 It nudged me to get started sowing the first of my salad greens and I had a little giggle at the ‘Tanya’s Salad’ printed on the side of the planter box. Actually, I think it would make a wonderful gift for gardening friends and family. Salad leaves can be grown indoors all the year round but I tend to grow mine mainly between March and September because I prefer to grow outdoors. The time from sowing to reaping takes three to six weeks, more or less, and is dependent on the time of year. The warmer it is, the quicker the seeds and plants will germinate and grow to maturity, providing they have enough protection from sun, wind, cold, and just enough moisture to keep them happy. 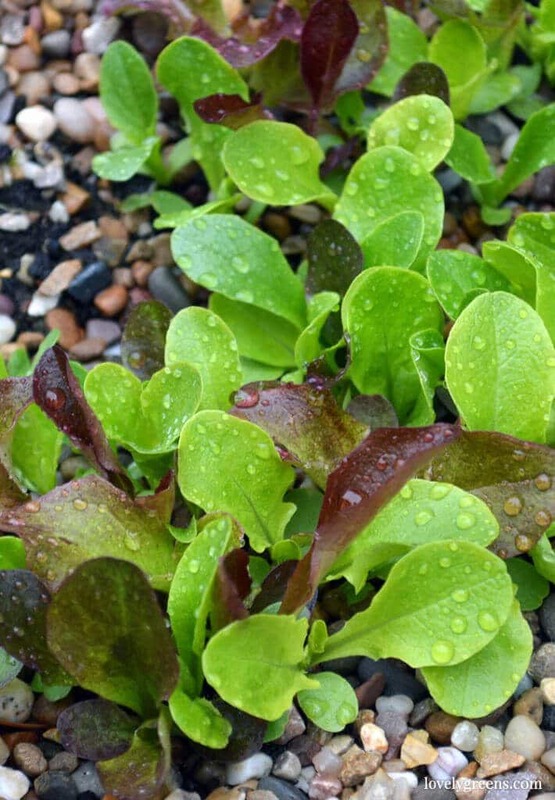 Cut-and-Come-Again – Usually clearly labelled as such, this term means that the greens (usually mixed lettuces) can be trimmed to about 1″ (2.5cm) above the soil and left to grow again for up to four crops. 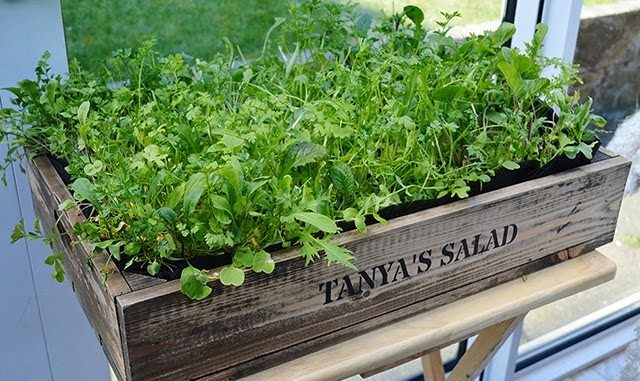 There are also some herbs, such as Arugula (Rocket) and Cilantro (Coriander), that will come in Cut-and-Come-Again varieties. 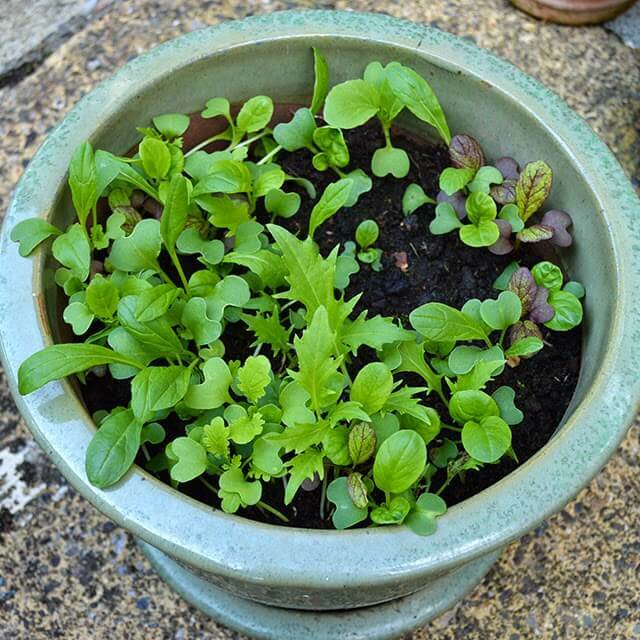 Baby Leaf Salad Mixes – these are often made up of a mix of lettuces, spinach, beet greens, chard, and Asian greens that may have to be resown again after the first or second harvest. You pick them when they’re ‘Baby’ sized so that the plants don’t suffer from overcrowding. Sometimes the instructions on the back of the packet will instruct you to take the ‘thinnings’ as baby leaf and allow the other plants to grow on to maturity. Not all crops/varieties will recover well after being harvested the first time so always make sure to read the seed’s instructions. 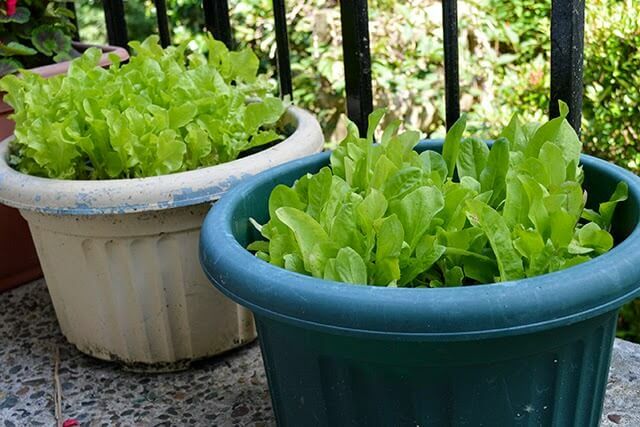 Growing salad leaves in containers is so simple that I feel it’s the perfect crop to start with as a beginner grower. The fact that you’ll have leaves ready for the table in a short space of time is also very attractive! Getting started and aftercare couldn’t be any easier either. Select your container. It can be any non-toxic and sturdy material including wood, plastic, or heavy duty cardboard but it should ideally be shallow, have drainage holes or slats, and a surface area of at least a foot square. Line it with landscaping fabric if there’s a chance that the container could leak from the sides or lose soil from the bottom. Fill the container with about three inches of all purpose compost of your choice. In this case, Peat-free, manure-free, organic, etc. is based on preference and ethos rather than the plants’ requirements. Open a packet of seeds and be rather heavy handed sowing the seed all over the surface of the compost. Now gently sprinkle a very thin layer of compost over the top. The rule with sowing seeds is that they should be at a depth of about two times the length of the seed itself. 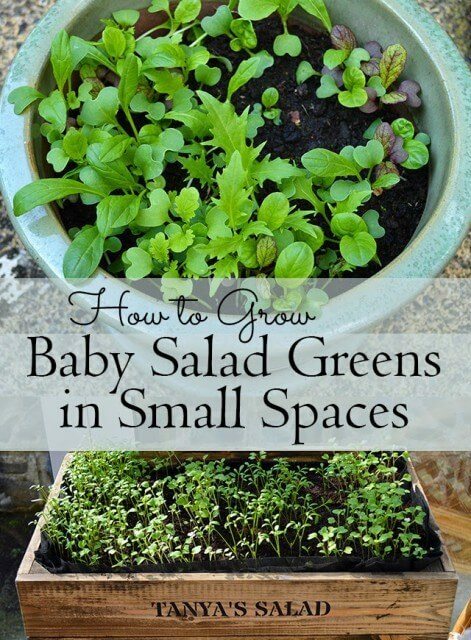 The seeds you’ll use with growing salad and baby greens will be tiny and if you cover them with too much soil they might not grow. Pat the surface soil down gently and if you wish, cover the top of the compost with thin layer of fine grit. Grit will help keep the compost from drying out and the baby seedlings won’t have an issue growing around the pieces providing that the layer you use is very thin. Water your container and keep the soil moist from that day forward and until the day there’s nothing left growing in the container. Compost will dry out easily and it sometimes is difficult to re-saturate if it becomes too dry. Also, your greens mix will suffer in dry compost and this may cause the plants to die or to ‘Bolt’. Bolting occurs when the plant is stressed or at the end of its life-cycle and basically means it stops putting energy towards growing leaves and starts producing seed. Watering tip: if you use a watering can with a rosette spout like this one then your young plants are less likely to be damaged while you’re watering them. Time to harvest depends on the varieties you’re growing but will average between three and six weeks depending on how warm it is. The further you get into spring and summer and the quicker crops will grow. They’re ready when the plants are two to three inches in height and look like the leaves you see in bagged salad mixes. 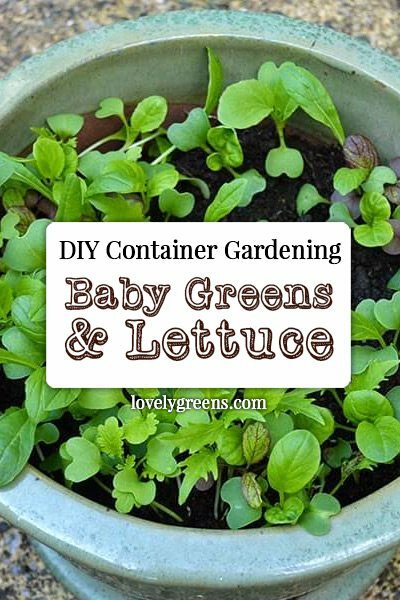 Harvest cut and come again varieties by snipping the greens with a pair of scissors to 1″ from the top of the compost. You can do the same with baby leaf mixes too or snip them all the way down to the ground if you know they’re a variety that isn’t likely to regrow. Subsequent crops of Cut-and-Come-Again will be ready within weeks but when you can see that the greens are tiring and not producing as much, or they begin to bolt, it’s time to re-sow. Fill the container with fresh compost and begin again. I’d recommend that you check out the seed offerings that Suttons has with their Speedy Veg selection – these are the ones I’m growing now and I like the variety of greens they’ve given me with their Italian Mix, French Mix, Spicy Oriental Mix, and Californian Mix. If you’re in the US, have a look at the items I found below through Amazon.com below. I was wondering how you tell weeds, that may float in while growing, from the real greens? Some weeds may be toxic, but one would just cut greens and then eat them right along with the salad!! Thanks. If you’re using sterile compost that’s unlikely to happen. As for identifying weeds, learning which is which is part of learning how to garden. Oh my goodness! love the photos – I'm SO ready for fresh salad greens, but we are still too cold to even think about it yet. thank you for sharing!